Did This National Restaurant Chain Put Too Much Love Into the Like? I’m glad that more and more companies are putting significant effort into their social media programs. Really, I am. But, we can’t let enthusiasm obfuscate reality, and that seems to be occurring with alarming regularity these days in all corners of the social Web. The most recent example to cross my inbox is from restaurant chain Buca di Beppo. I’m a fan of these eateries, and have spent many lovely evenings at various locations, gorging myself on meatballs with friends and family. But when it comes to their Facebook promotion, I’m feeling a little sick to my stomach. I received two emailed press releases with no cover note and no personalization or explanation of any kind from Braintrust Marketing & Communications in Las Vegas (presumably the agency for Buca di Beppo). They breathlessly tout the results of the restaurant’s Social Media Day promotion (did you miss social media day? It was on June 30. Send carnations next year). Evidently, this national restaurant chain (a division of Planet Hollywood) went from 66,000 Facebook “likes” to more than 100,000 in just one day. 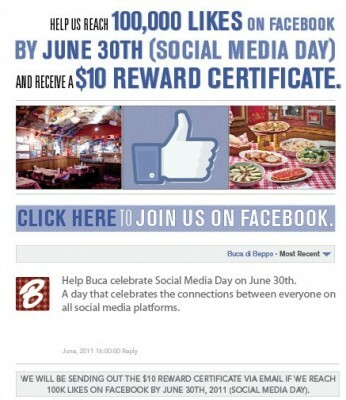 To achieve this milestone, Buca used its email database of more than one million eClub subscribers, promising that if 100,000 total likes were tallied by June 30, all eClub members would receive a $10 gift certificate. Not surprisingly, the company cracked the 100,000 barrier the same day the email was sent. 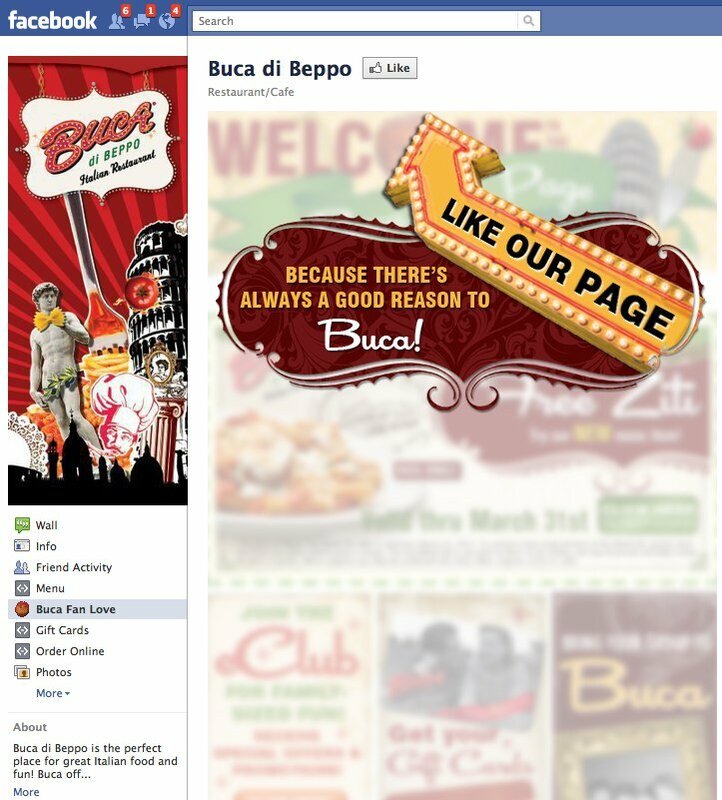 Let’s assume that 73% of Buca di Beppo’s email club visits Facebook (matching the U.S. average, based on Comscore’s findings to that effect in May, 2011). Buca says their eClub is more than one million strong, but let’s use an even one million. Thus, we’ll stipulate that 730,000 eClub recipients are on Facebook. Let’s assume that 23.3% of Buca di Beppo’s subscribers open emails from the company. I have no idea what their open rate is, but 23.3% was reported by major email provider Epsilon in the first quarter of 2011 as the industry average. That would mean that 170,090 Facebook-using eClubbers opened and read the offer. At least 34,000 of that group acquiesced and agreed to “like” Buca di Beppo, which is a conversion rate of 3.4% of the total list, and 19.9% of the Facebook-using email openers. Now, let’s consider the cost side of the equation. Sending one million emails isn’t free, either. I don’t know who Buca uses for email, but I’m going to assume for our purposes here that they are paying an email provider .003 per sent email, a competitive rate for mid-volume senders. That would put the email sending cost at $6,000 for at least two emails (announcing the promotion, and then sending out the reward certificates). You also have costs for Facebook page creation (they have one of the best landing pages I’ve seen) and management, email design and management, and PR firm costs to create and distribute the release (although I’m assuming blast emails to bloggers are pretty cheap these days. In fairness, the PR firm was very good about getting back to me with answers to some follow up questions I had). Buca di Beppo was able to drive consumer behavior quickly. But they had to outlay a lot of cash and effort to do so. And what now? You’ve bought some likes from people that ALREADY were fans of the brand because they were on the eClub list. A worthy goal would be that EVERY member of the eClub on Facebook should be a fan of Buca. That would be something like 730,000 likes, not 100,000. And since they’ve already taken the effort to sign up for email, shouldn’t you be able to make that happen without giving them each $10 to click a button? I’d argue that you at Buca di Beppo saw firsthand the power of “giving $10 each to people who already have said they like you” possesses, and continuing to embrace that is to snuggle up to the false prophet of fuzzy social media math. I give Buca credit for putting so much weight behind their liking campaign. But I’m not sure the math matches the method. I would love to see a press release in 30 days from Buca that shows redemption rate and average check stemming from the $10 reward certificate program, so true ROI could be calculated.